Anibild® THREE - A professional armature kit unlocks endless possibilities. Build your characters and creatures from scratch using precision engineered, stainless steel, professional parts. For best results, glue all balls with a threading compound (Loctite) not included but available here. 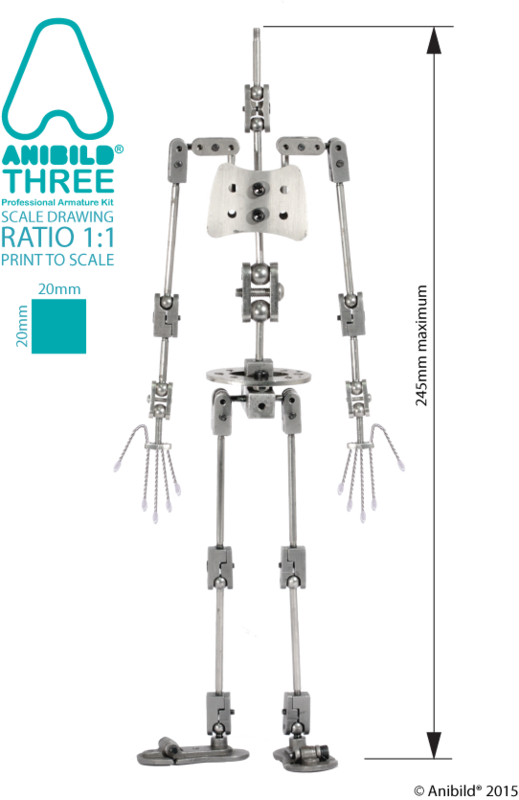 Anibild® THREE is a precision-engineered armature to deliver maximum effect required by advanced and expert animators. The kit contains stainless steel joints with hardened stainless steel balls and socket head screws to make a humanoid armature. The joints are compact, strong and robust lending themselves to lengthy television production and feature film work. Anibild® THREE also contains multiple rigging points for your characters, which is fully integrated with the Anibild® Professional Rig system to support and execute technical and dynamic animation moves with your puppet. Anibild®, although technical in it’s specification, is incredibly easy to assemble. All balls and bars are M3 threaded and can be secured into the balls using a strong thread-lock (not included). *Joints are 15mm in length. We recommend armatures being no larger than 30cm tall. Anibild THREE will also require basic hand tools to put together (not supplied). Please note that you will need Locite threadlock glue to make a perminant fixing off balls to threaded rod (not included) avialable to purchase here.